The measure was tucked away in a budget line on broader Service SA changes – which also include closing well-patronised centres in Mitcham, Prospect and Modbury. 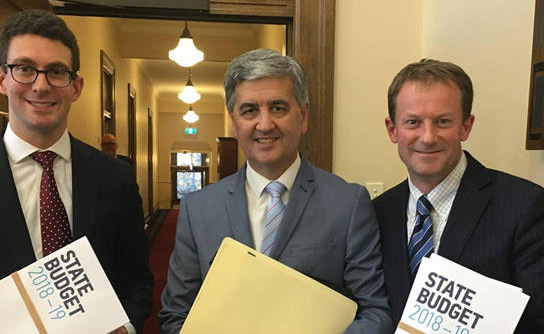 Treasurer Rob Lucas’ budget identified $18.8 million in savings over four years “through a review of the [Service SA] branch network and service demand levels to identify opportunities to improve efficiency”. “Changes will be made to increase the digitisation of processes, improve the availability of online services, and implement cost recovery for merchant fees,” the budget papers say. The Labor Opposition today sounded the alarm over the proposed change, which would have seen a transaction fee – traditionally borne by government – instead passed on to consumers when they paid a bill through Service SA. Shadow Treasurer Stephen Mullighan described the move as a “mean and punitive measure” that would “drive up the cost of car registration, licence fees and every other bill that people need to pay with Service SA”. “Even the banks – easily the greediest members of the Australian community – are getting rid of transaction fees and ATM fees, and yet we’ve got Steven Marshall and [Transport Minister] Stephan Knoll behaving like it’s the 1990s and imposing fees on transactions that every South Australian needs to engage in,” he said. But in a statement to InDaily today, Knoll said the Government “can rule out cost recovery for merchant fees with Service SA transactions”. “This was an option when the State Government handed down its first budget – however, it would have resulted in an unreasonable increase in costs for South Australians,” he said. It’s understood the broader strategy is set to be unveiled within weeks. It’s unclear what the budget impact of the cost recovery backflip will be. In the meantime, the Government has not responded to questions about its election commitment to open a new Service SA centre in Mount Barker – a move that appears at odds with the closure of three existing centres and a broader digitisation strategy. The three centres slated for closure are among the busiest in the state, with the Prospect hub serving 105,103 customers in the last financial year, while Modbury serviced 104,519 and Mitcham 83,182, according to documents released last year under Freedom of Information. This is the line up at Service SA Modbury this morning. In 2017/18 Modbury Service SA conducted an additional 10,000 transactions compared to the previous year. 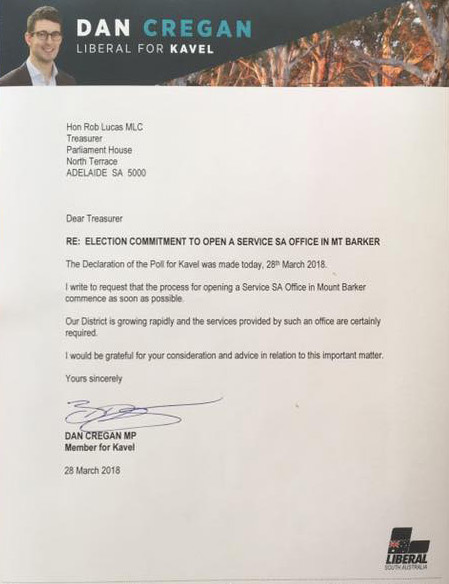 Dan Cregan, the Liberal member for the Hills seat of Kavel, has long spruiked a new centre for Mount Barker, writing to Lucas after the election to demand a new hub because “the services provided by such an office are certainly required”. The September budget contained a $1.9 million commitment over four years for a new Hills Service SA Centre, including $470,000 in 2018–19. “This will improve access to important services such as vehicle registration to residents of Mount Barker and the broader Adelaide Hills community,” the budget papers state. But questions about the progress of plans for the new facility – and whether its establishment is at odds with moves to close existing centres and rationalise services – went unanswered today from Knoll’s office. Cregan did not respond to inquiries.